This comes to us from faithful reader Jon. This was another one of those albums that I toyed with buying on eBay, but never got the chance. It's strange hearing a regular voice mixed with the Smurfs, but it's different! Hey, if I have a Smurf album today, can I call today Blue Monday? NOTE: This file is a .rar file, so you need a program like WinRAR to unzip it. I think this would certainly qualify as Way Out Junk. 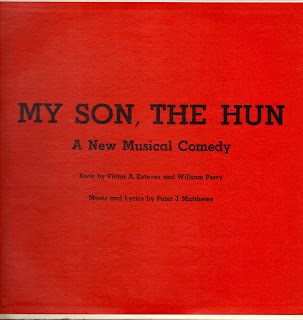 After all, how often do you hear a prep school musical about Attila the Hun?? All I know about this album is what's on the front cover that you see here (the back cover is totally blank) and the record label. The label inside says "Performed by Fordham Preparatory School and the Mt. St. Ursula Academy" It says "Director Records" on the top and "Manufactured by RCA Victor Custom Record Department" on the bottom and is copyrighted 1966. I'm guessing this might have been some sort of souvenir for the cast members of the show. I don't know who they are because there are no other names listed here. I'm figuring these kids are middle school/high school age. I did find that Fordham is an all-boys school and Mt. St. Ursula is an all-girls school. Maybe they got together each year to do a show, I don't know. How is this? Well, considering the supposed ages of the people involved it is a mixed bag as you might guess. They tend to do better on the faster songs than on the ballads. I do like a couple of songs and performances on here though. "Do What You Want" is a fun little patter song that must have been a pain to memorize. I also like "I Go Where the Action Is". There's also some contemporary (for 1966) references thrown in as well. If you know any more about this (or if you might have been IN this! ), please share your insights with the rest of us. Until then, enjoy! Well, "Way Out Junk New Album Week" now ends its broadcast day. I hope you guys all enjoyed it. But wait. What's this? It looks like I've got so much of a backlog (forward log?) now that "Way Out Junk New Album Week" is being HELD OVER for a second big week!!! How do you like them apples, kids? This was one of those albums that I had wanted for quite a while. I had heard songs from it, but never owned it. I was finally able to snag one and thought I'd pass it along to you. This was released in 1993 but was recorded a few years before that because it's Jim Henson voicing Rowlf. 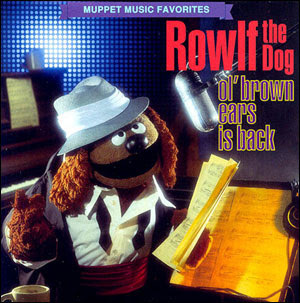 This album contains a number of songs that were previously performed on "The Muppet Show"; some originally by Rowlf and some by others. It's a fun variety of songs and, as always, I hope you like it! Here's an odd combination of Christian ventroquism and conservation! 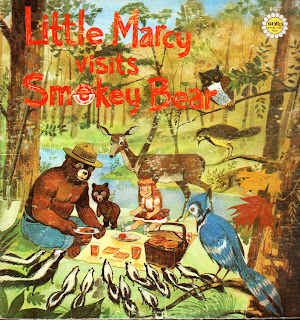 Little Marcy has a picnic with Smokey Bear and all their friends in the forest. And just so you don't forget which side Marcy's bread is buttered on* near the end of the album Marcy peeks into Smokey's window and sees him praying before he goes to bed. Anyway, this is a fun (if unusual) story, and I hope you like it! 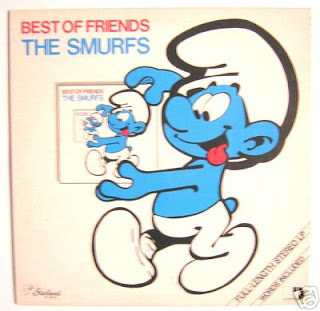 Here's some fun songs from our little blue friends the Smurfs, brought to you by Jon, one of our great blog readers. Thanks Jon! NOTE: Dave at Children's Records and More has both front and back cover scans and the lyrics sheet for this over here. Find them there and look at all the other cool stuff he has, and tell him I sent you! This one comes to us courtesy of Big Bird Fan at Way Cool Music . It's one of those story records that uses audio clips from the movie tied together with narration so, unlike the other Annie records I've featured here, this one has the original movie cast. He's got some great stuff at his site too, so give him a visit and tell him Tony at Way Out Junk sent you! BONUS: Big Bird Fan also included a plethora of episodes of the Little Orphan Annie radio show (and this file as well) and you can get those here! 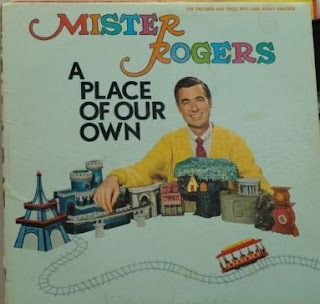 Way Out Junk Free Album Week continues with a great Mister Rogers album brought to us by John, another one of my wonderful WOJ readers. This is in honor of what would have been Fred Rogers' 80th birthday. Thanks John! (I'll have another humongous Mister Rogers contribution from John coming soon.) You can find another Mister Rogers album called "Let's Be Together Today" over here from Big Bird Fan at Way Cool Music. And speaking of him, we'll have a contribution from him tomorrow! NOTE: This is a .rar file, so you may need a program like WinRAR to unzip it. This seemed like the ideal album to start my New Album Week. This has a bunch of songs that were supposed to have been featured on Romper Room and Ding Dong School. 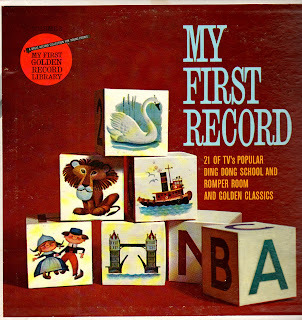 I never saw Ding Dong School (I think that was a little before my time), but I vaguely remember Romper Room. I only song I recognized from that was the Do-Bee Song, but you might know some of the others from that as well. There's a couple of classical instrumentals on here as well. I know that wouldn't have done much for me (it's not peppy enough), but it might have floated your boat. Anyway, hope you like it, and let's hope that New Album Week goes off without a hitch! 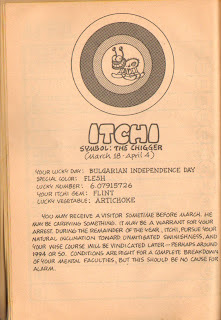 Here's the next in the Prof. Otis G. Firefly Zodiac: Itchi the Chigger! Note: the joke about 1994 is funnier if you realize this book came out in 1974. Therefore, please reread the sentence substituting the year 2028. See? That's MUCH better! Don't forget: WOJ New Album week begins Monday March 24th. One new album every day this week, as long as Blogger's scheduling posts function works. In fact, a few people may have accidentally gotten a couple of albums early (like my 44 Bloglines subscribers). I accidentally hit Publish instead of Save. I took them back off a couple minutes later. Don't worry though. Everyone will see them soon. And for those of you who may have seen them early, don't tell everybody else. It's more fun that way. Thanks! Hey Gang! Believe it or not, I'm still around. I've been working on getting stuff together, when I saw that Blogger is now offering the option of Scheduling Posts. That means I can make a blog entry for July 4th now and schedule it to not appear before then. WAY OUT JUNK NEW ALBUM WEEK STARTS MONDAY MARCH 24TH!! 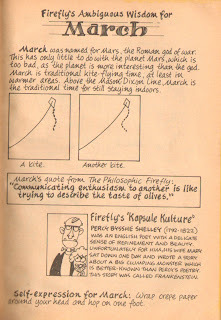 And here's your Prof. Otis G. Firefly wisdom for March! Click the pic to blow it up real good. Thank you all (or at least all of you that are left) for your patience! 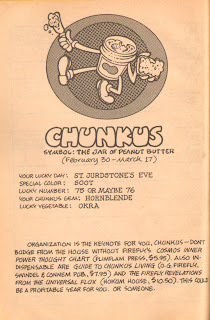 Here's your next sign in the Otis G. Firefly zodiac: Chunkus!